Felix “Felo” Martinez, a retired butcher and beloved family man, died on April 4, 2019 at home, surrounded by his family. He was 84. The son of the late Manuel and Maria Rodriguez Martinez, he was born in Guayama, P.R. on January 7, 1935. He is survived by three children; Felix A. Martinez of New York City, Gilbert Martinez and his wife, Jeanne of Maybrook, Christina Dodson and her husband Stephon of Pine Bush, a brother Frank (Paco), a sister Virginia of Puerto Rico, and five grandchildren; Olivia, Thomas, Chase, Zoe and Brandon,...and many nieces and nephews. 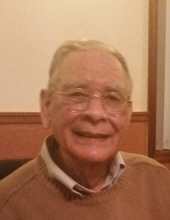 he was predeceased by his loving wife, Gladys Martinez in 2018. Visitation will take place at Applebee-McPhillips Funeral Home, 130 Highland Avenue, Middletown, New York on Monday, April 8 from 2 to 4 and 6 to 8. Burial will be private. In lieu of flowers, memorial contributions in Felix' name may be made to Hospice of Orange and Sullivan Counties, 800 Stony Brook Court, Newburgh, NY 12550. To send flowers or a remembrance gift to the family of Felix Martinez, please visit our Tribute Store. "Email Address" would like to share the life celebration of Felix Martinez. Click on the "link" to go to share a favorite memory or leave a condolence message for the family.